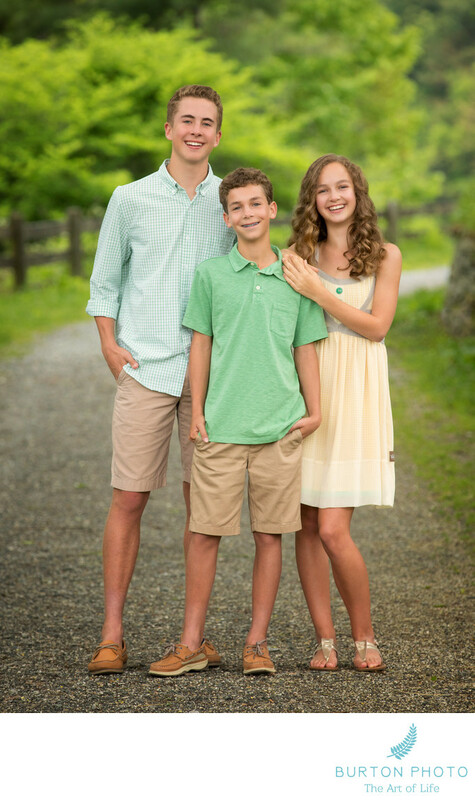 We created this fun portrait of two brothers and their beautiful sister as part of our annual Portraits on the Parkway event held each year in May. Jonathan and I love to create portraits of children of ALL ages but this annual event is geared specifically towards school-aged kids 5 to 18 years old. With only 10 minutes to create an amazing portrait, we have to work very quickly with children mature enough to follow directions quickly and easily separate from their parents. We are always so excited to photograph 50+ sessions over the course of several afternoons/evenings. It is exhilarating!!! A portion of our proceeds from the event is donated to the Blue Ridge Parkway Foundation. The Manor House at the Moses Cone Estate is undergoing extensive repairs and restoration. We're happy to be part of that effort. We love the Parkway and the miles of carriage trails on the Moses Cone Estate. What a wonderful resource for the surrounding communities of Blowing Rock, Boone, Banner Elk, and Linville.